We are living in a world where looks matters a lot. Be it the way you dress, the way you carry yourself or the phone which you are having. Smartphone is now considered as the main part of a person’s personality. People have started judging others on the basis of the phone a person uses. So, just imagine how it will affect your personality when people will realize that you are actually using a fake phone or to be specific a fake android device. Yes, you read that exactly right. It is very much possible to perfectly clone an android device. In the era of technology, everything is possible. You can even get a fake iPhone and a fake Samsung Galaxy S6. The level of copying is so high and perfect that you can’t differentiate between a fake device and a normal device with naked eyes. The chances of ending up with a fake android device rises when you buy them form online stores or from a sale which offers 50% off, 80% cash back etc. There are many common ways to know whether you are using a fake android device or not. For example, fake device arrives with an LED flash which is yellower in color and looks weird. Other common things to know about fake devices are thickness of the device, location and size of audio jacks. One of the most useful way to check the originality of your device is the display. A HD display is the expensive part of a smartphone and if you feel that your HD display is blurry and goes unresponsive most of the time, it is sure that you are actually a victim of fake android device. However, things get complicated when the fake is really good. In that case, there is an android app which is very much useful. This app analyses a number of variables and phone settings and can tell you whether your Android device is a fake one or not. 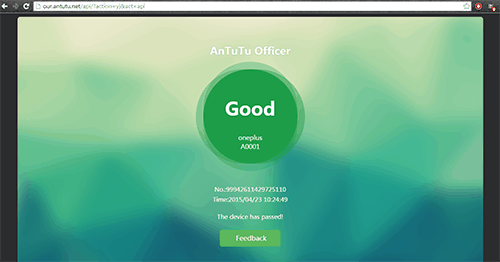 The app is AnTuTu Officer and we’ll tell you how to use it. 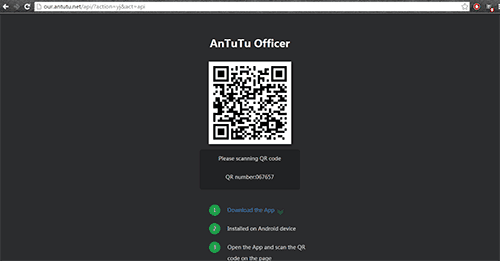 Go to Play Store on your Android device and search for the AnTuTu Officer App. Click on the first result of the search and now, click on install. Accept the permission which the app is asking for. The app will start downloading. It is small in size and will take 2-3 minutes depending on the speed of your internet. Now, open the app. You can also open the app from the menu or directly from the Play Store. The initialisation starts when you open the app. 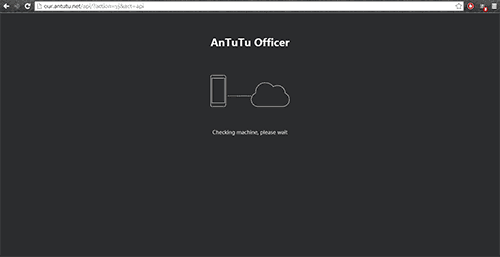 Now open y.antutu.com on your desktop/laptop. You will see a QR code on the website. Now, open the app and you will see a complete green screen as shown in the screenshot. Click on the start button at the bottom of the screen. As soon as you click on the start button, it will activate your camera and a QR code scanner. You just need to scan the code from the website. 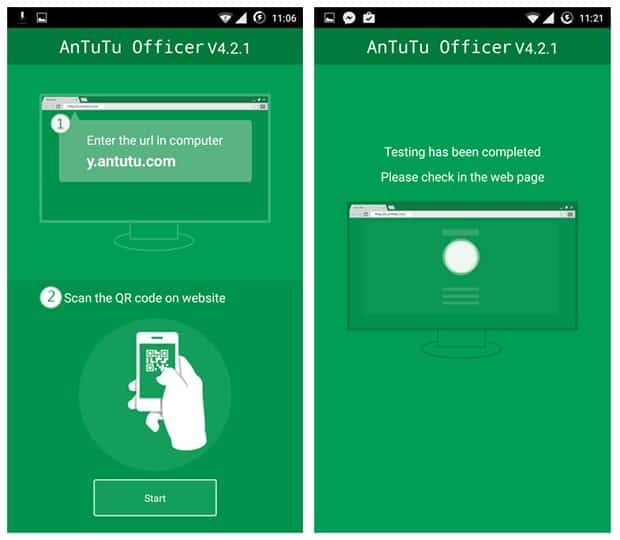 As you scan the code, both the laptop and your smartphone will start doing the process. It will take some time and the result will be displayed on the desktop screen. If the result on the desktop shows Good, it means you are using a complete authentic device. The result will also show you which device you are using. If there is a fake device, you will see a red result on the website saying High Copy. This is one of the best and most useful way of finding out the originality of the Android device. 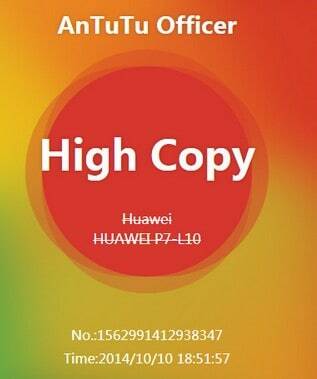 If your result shows “High Copy”, you need to take action against the seller as it is a crime to sell fake products. In case of, “Good” result, you just need to sit back and enjoy the original device.